– Dolly Parton helped bring the seminal and beloved TV show Buffy the Vampire Slayer into existence. Her production company, Sandollar Productions, will be familiar to you from the end credits. – Dolly Parton once lost a Dolly Parton drag contest. … just some of The Awl‘s “Facts about Dolly Parton” (on the occasion of her 70th birthday). 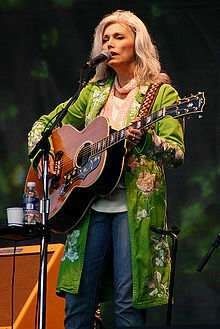 As we swear our undying love, we might also remark on Emmylou Harris. A solo artist, bandleader, interpreter of other composers’ works, singer-songwriter, backing vocalist, and duet partner, she has collaborated with artists including Gram Parsons, Bob Dylan, John Denver, Linda Ronstadt, Roy Orbison, the Band, Patty Griffin, Mark Knopfler, Delbert McClinton, Guy Clark, Willie Nelson, Bright Eyes, Rodney Crowell, John Prine, Neil Young, Steve Earle, Ryan Adams…. and of course, Dolly Parton. Harris became a member of the Grand Ole Opry on this date in 1992.